I am so ready for Spring. Flowers blooming, trees filling out with leaves, grass turning green, and butterflies. Warmer weather, gentle rains, and unfortunately – tornadoes come with the Spring season here in Oklahoma. I must confess. I’ve been a bad girl. I made a trip to Michael’s and Hobby Lobby today. Leaving both stores with various products. Among my purchases was alcohol ink. I’ve seen many YouTube videos on using the alcohol ink and the items turned out quite beautiful. So I grabbed a pack and came home to play with them. 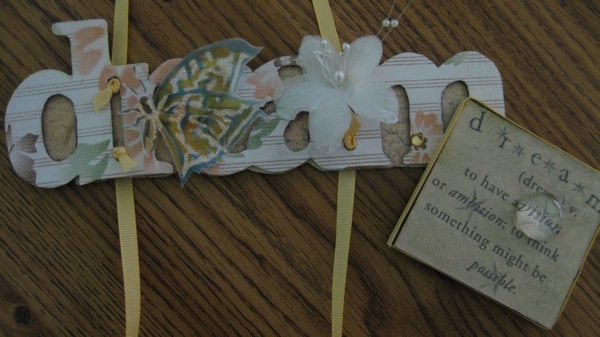 I have a two-step stencil to create these butterflies in my stash of stuff. 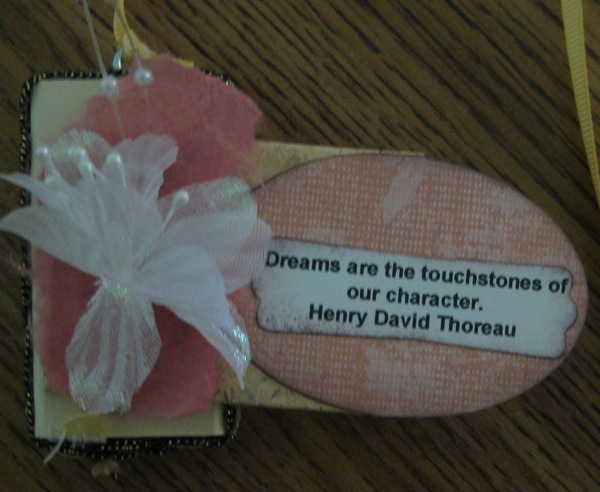 I’ve been playing with it the last couple days with my Soft Subtles Stampin’ Write Markers. On vellum they make pastel butterflies that turned out fairly good. At least after the 15th attempt at making them even resemble butterflies since I could not get a handle on proper use of the stencil. One of the things I tried was heat embossing since the marker remains wet longer on vellum than it would on standard card stock. Pretty awful results I have to say. It took four tries with the alcohol ink to begin getting decent results. They got better each time I tried to be less heavy handed with the product. I found that less product applied to a cotton ball, since I didn’t purchase the blending tool and felt pads, was the key to getting a good application. The use of my Basic Black Stampin’ Write Marker brought out the real beauty of this butterfly and I was excited with the results. A bit of Cosmo Glitter in places made these, already, beautiful butterflies more delightful. I now have color stained fingers and nails, something I belatedly found out, and five absolutely beautiful butterflies. These are now posted for sale in my Etsy shop. 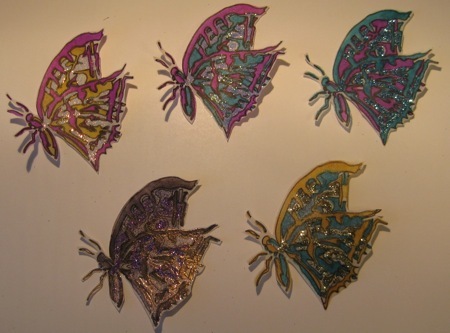 All five butterflies are sold together in one set. I may be in hot water with Stampin’ Up! but I’m immensely thrilled with these results. Now that you have taken a few hours, or a few days, to get your rubber stamps unmounted from the wooden blocks have you sighed a huge groan. Or said “Now what do I do with all these blocks”? As you look at the pile before you are you inspired or overwhelmed? Are you caught between the desire to chuck them in the trash, head to your nearest recycling center, or are you eying your fireplace and wondering how much heat they will provide? Can I be of some assistance? Would I be able to get the dread out of your head and have the creative sparks pinging around in your brain? I’ve used two of the wooden blocks and suspended them from a chipboard word with 1/4 inch grosgrain ribbon with small screw eyes. I had to get my husband’s cordless drill and the smallest diameter drill bit I could find. Once I determined the bit was spinning in the right direction – not reverse – I was able to drill a hole in the center of each block at the top. I went in just deep enough for the screw eyes to fit snugly at the top of the block. If you would like to see how I made this check out my video for this project. If you would like to forgo the work involved and would like to have it now – well practically now – it is for sale at my Etsy Shop. I will have another idea showing up in the next few days. That power tool thing wasn’t too bad, I just might have to give it another try. I’ve taken the step into Etsy. My first offering is a mini album kit with a musical theme. The background papers are a single sided design light weight paper and cut to 6×6. There are thick card stock papers with a musical theme on the front and plain on the back. 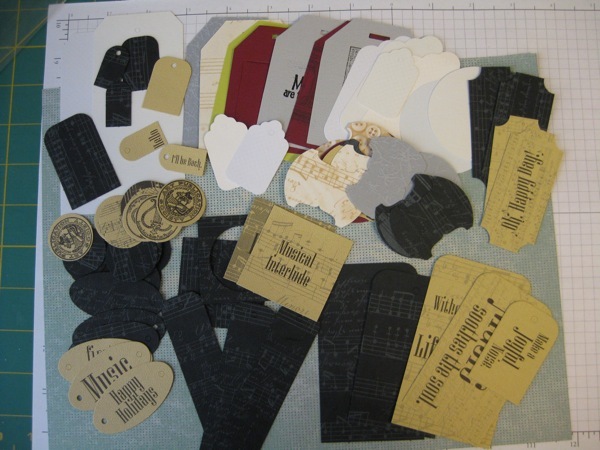 Instruments and sheet music are the designs of the card stock. 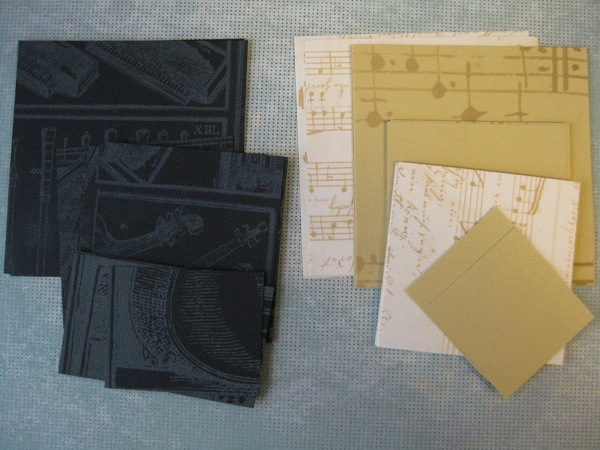 These card stock papers can be used as background papers or as the larger tags for paper bag albums. 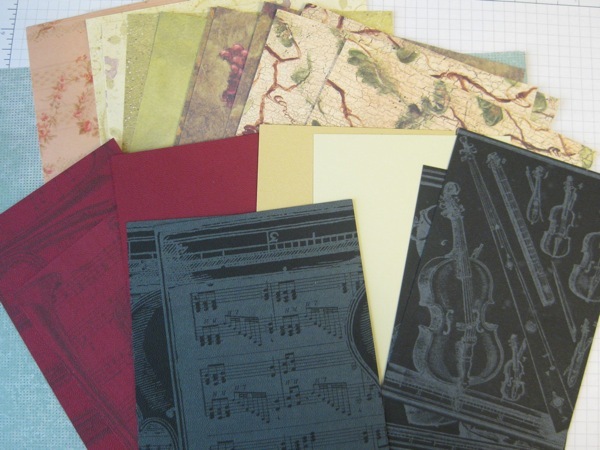 The kit contains an assortment of card stock papers ranging in size from 3-3/4 x 3-3/4 down to 1-1/2 x 2. All of them have some kind of musical treatment. Not only dancing, but a music recital at your child’s school or a competition are opportunities to use this kit. This kit also contains Top Note (by Stampin’ Up!) die cuts, two in card stock and one out of fabric. 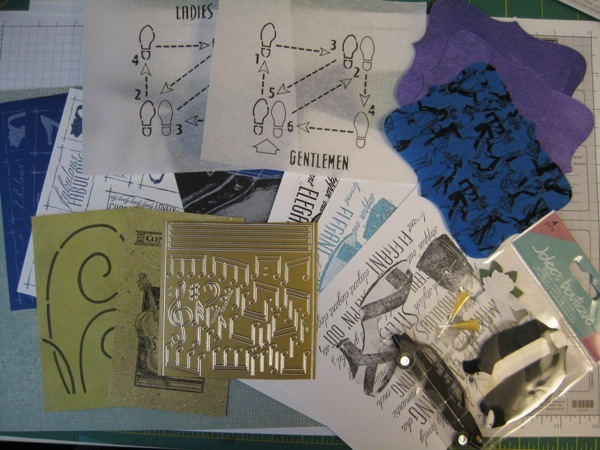 I have used a stencil to make the dance step graphic on vellum, one for the Lady and one for the Gentlemen. 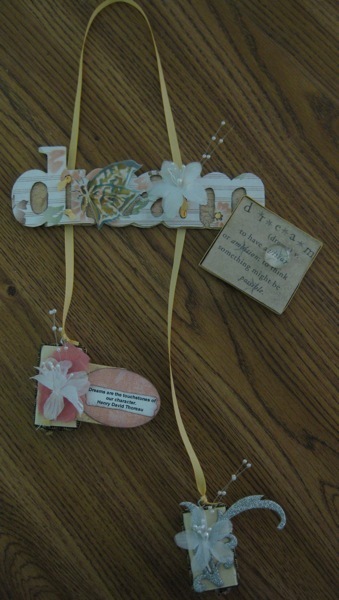 There are three sheets of tags ready to be cut out and used as embellishments for your pages. These sheets are factory embossed and on heavy card stock. A swirl stencil was used on a piece of light weight paper and is just right for stitching beads on. Another piece of light weight design paper has stamped images. A sheet of gold music note stickers for you to compose your own music. Three background stamped images I have made, two of which have been heat embossed in a turquoise and black, the third is stamped with black ink. A fabric embellishment from my local craft/hobby store of a man’s tuxedo is included in this kit. Tags and more tags are included in this kit. All of the tags are on heavy card stock. Some are printed most are blank. I have used my Big Shot to die cut medium sized tags, and I’ve used my Round Tab Punch to cut out tabs for journal spots you want to tuck away but have easy access to. There are circle tags, oval tags, rounded top tags, all kinds of tags for you to embellish. 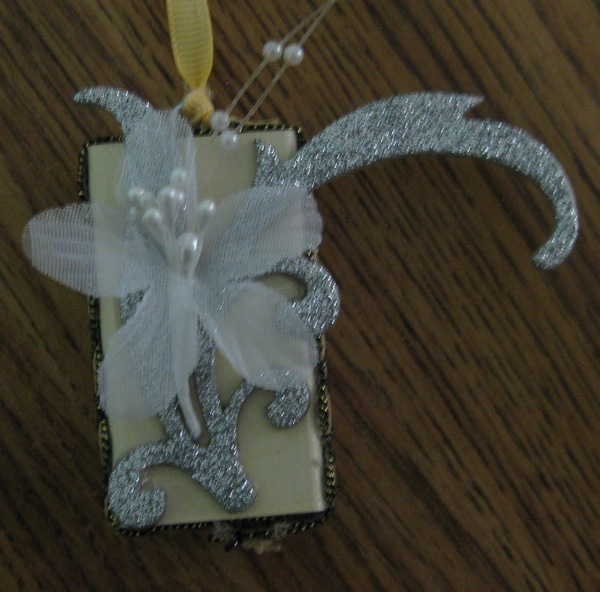 The print is on one side of the papers so you can turn them over and create your own embellishment. Ribbons and fibers in different widths are included. The lengths range from 12 to 16 inches and wrapped on a tag. Die cuts of a dragonfly I made are on a gold vellum for one set and on white vellum for another set. You can glimmer mist, paint, emboss, or whatever strikes your fancy on the white vellum dragonflies and attach them as you wish. There are two acrylic pieces for you to display on your page. Attach them with glue or stitch them down by the holes drilled in the corners. 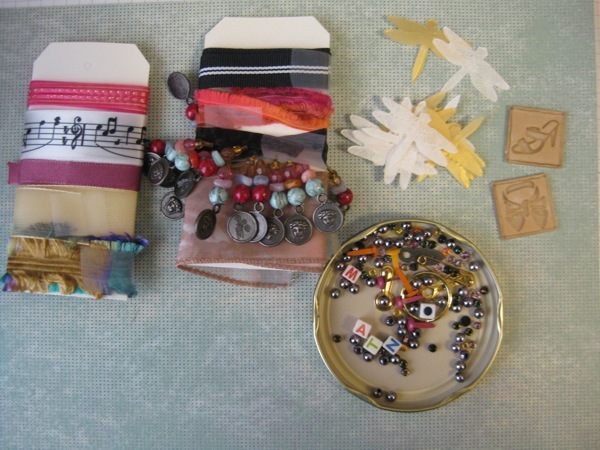 Beads, findings, block letters that spell out “Waltz”, and brads are included in this kit. If you would like to see how I put this kit together you can watch the two part video I have made. Stepping Out Part 1 and Stepping Out Part 2 can be viewed by clicking on the links. I have two kits available at my Etsy store – http://www.messageinafold.etsy.com.